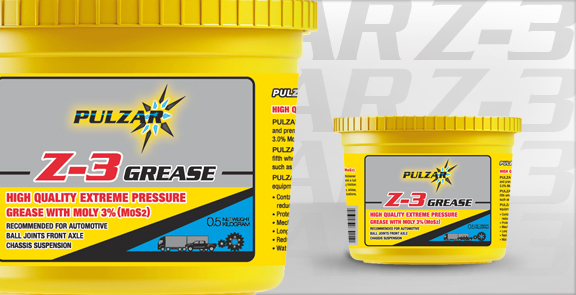 PULZAR Z-3 GREASE is a heavy duty, extreme pressure grease formulated with a special thickener and premium high viscosity base fluid. It is fortified with various selected additives and a full 3.0% Molybdenum disulfide for maximum load carrying capabilities and reduced sliding friction. MoS2 has a natural affinity for metal surfaces and provides residual dry film lubrication in the event that the grease itself is lost. PULZAR Z-3 GREASE is multi-purpose lithium base grease whose tough, slippery, protective, microscopic-thin film prevents metal-to-metal contact. It offers excellent mechanical stability, pumps well at low temperatures and maintains consistency without oil bleed even in long-term storage. PULZAR Z-3 GREASE contains an oxidation inhibitor to ensure long trouble-free performance and is fortified to protect against rust and corrosion. PULZAR Z-3 GREASE is recommended for use in industrial gear and bearing sets, bushings, slides, fifth wheels, farm and off-highway equipment, railroad hitches and in automotive applications, such as chassis suspension parts, constant velocity (CV) joints and ball joints. PULZAR Z-3 GREASE is ideal wherever extreme pressure grease is desired, especially where the equipment manufacturer specifies at least a 3.0% molybdenum disulfide content.